Good Lord, what is going on with the world? 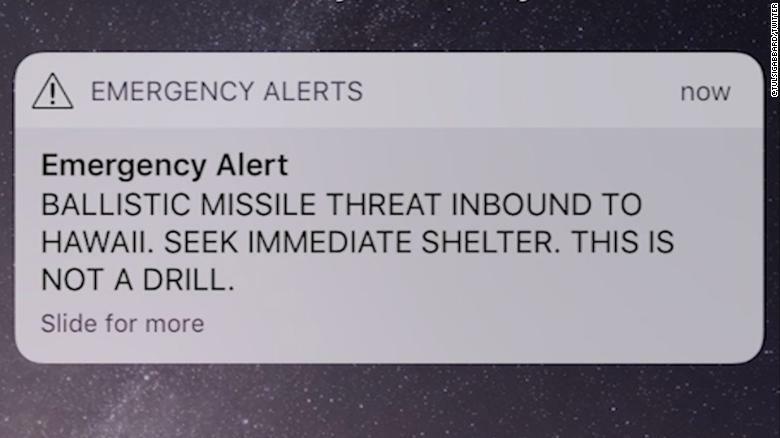 After Hawaii just suffered through a scary false alarm of a ballistic missile attack, now Japan has also had a false alarm, this one sent out by Japanese broadcaster NHK by mistake. Around the same time our “Stable Genius” leader was tweeting about the size of his “nuclear button” like he was a high school freshman, the Centers for Disease Control and Prevention announced that they are going to hold a session on January 16th about teaching federal, state, and local first responders how to “prepare for a nuclear detonation”. Both Guam and Hawaii have been more focused on nuclear threats in recent weeks and months, as both places are likely within the range of ballistic missiles from North Korea. 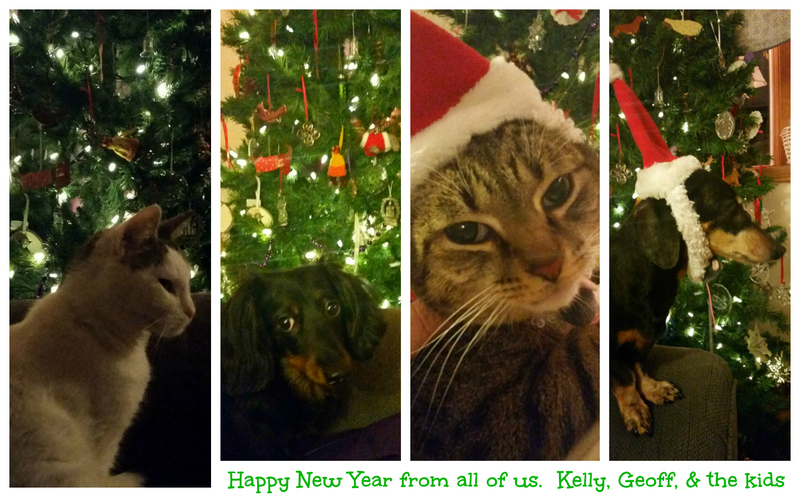 Author Kelly and GeoffPosted on January 10, 2018 January 10, 2018 Tags childhood, general geekery, history, it's the end of the world as we know it, movies, my cat is smarter than President Trump, news, politics, popular culture, scary, video, war1 Comment on Should we be worried? For several years now I’ve seen people wringing their hands about Donald Trump over one specific thing that I intrinsically understand about him but that most people seem unable to. It was evident in his campaign and has only become more evident since his sham of an election: Trump lives in his own extremely subjective reality. If you’re on Twitter and you read @docrocktex26 then you know what I’m talking about. Donald Trump is a raging, decompensating, malignant narcissist. It was obvious during his campaign and it has become so obvious now that it would be painful to watch if he wasn’t also such a horror of a human being and in a position to destroy so many lives as his own falls apart around him. I’ll go ahead a put the disclaimer here now: I’m not a doctor, psychologist, social worker, or other medical or mental health professional. I am someone who’s had 25 years of experience dealing in my own life with a malignant narcissist. I can spot them quickly now and I have seen what they’re like, especially when they have a secondary diagnosis which aggravates the first. In Trump’s case that appears to be Alzheimer’s or a form of dementia. Here’s why all of this is important. The media, the general public, and lots of folks in the government keep asking the same questions over and over again. “Why does he lie so obviously? Doesn’t he know we can fact check him? Why does he say outlandish and patently, provably wrong things? Who does that? When will it stop?” Pro Tip: It won’t. The answer is not that Donald Trump has some special disregard for the truth or the rules. The answer is not that he’s extra stupid (he’s just garden variety stupid, folks). The answer is that someone who is that serious a narcissist constructs a world view in which the only thing that matters is what they think, say, and do. That means that his entire reality is subjective and fluid. If he says that he talked to the Boy Scouts, then he did so. If he says that Heather Heyer’s mother loved what he said, in his mind she did. Even if the call never really happened. When lies are pointed out to him he simply waves them away. We are in the wrong, you see. It’s hard to explain this to neuro-normative folks and those who haven’t seen a narcissist up close in person and in action, but these people are so good at manipulation that they believe their own lies to the exclusion of all else. Because deep down their own psychological injury and ego steers everything they do, they fit the world around them to to their own narrative. Most importantly, narcissists are completely devoid of empathy. While some of you may have heard that said, the ramifications of what it means regarding subjective reality are incredibly important. Someone like Trump understands himself to be the center to his own universe. His family, children, wife and ex-wives, and grandchildren are, at best, extensions of his own ego. They are trophies to be held up and stared at and to be shoved aside and ignored when inconvenient. He is not capable of actually loving them and they are a means to an end to be used when he needs them, ignored or worse when he doesn’t. Putin, on the other hand, is a goal. Putin himself could be anyone in the world, who he is as a person doesn’t really matter. What he represents is everything. He is a crime kingpin, the leader of a massive country that he controls with iron grip, and he is the wealthiest man on the planet. For Trump, attaining the presidency of the United States was really a booby prize by comparison. What he wants, more than he’s ever wanted anything, is to be the richest, sexiest, baddest, blondest, strongest, most terrifying man in the entire world. His continued relationship with Putin proves that he is willing to do anything to get to where he perceives Putin to be. Do I agree that Putin is “richest, sexiest, baddest, blondest, strongest, most terrifying man in the entire world?” While it’s more than probable that he’s the richest man in the world, I don’t agree with the rest. Most westerners won’t. But Putin projects the exact image that Trump has created in his own mind about himself. So he’ll stop at nothing to achieve and reinforce that goal (especially as he ages and his Alzheimer’s makes it more difficult to sustain his own self image). This includes treason, sedition, and more prosaic things like joining forces with white supremacists, Nazis, and neo-Confederates. At his core is this malignant narcissist a racist and bigot? Yes. And no. Oh, I’m quite sure he was gleefully taught racism, sexism, homophobia, and hatred at his father’s knee. There are reports going back to his elementary school days of Trump being a bully. But we have to remember that with someone who is a narcissist we’re working with more than a learned behavior. There was more going on when he was finally forced by his staff to read his too late, too short condemnation of what happened in Charlottesville last weekend, and that’s this: he fundamentally doesn’t care about anyone other than himself. He can’t, he lacks the basic programming to do so and doesn’t care to try to learn how. Bigotry is a super convenient vehicle for a narcissist to express a general disdain for anyone who isn’t them. A narcissist on the level of Trump is so emotionally stunted and isolated from the rest of us that hate is easy. Hate is a tool. Choosing to “other” the rest of us and make us the enemy, use us as tools to achieve a particular goal, or simply destroy us for fun isn’t a hard decision to make. For Trump, deciding to allow or encourage the deaths of peaceful protesters, students, bystanders, or anyone else not integral to his need to become Putin 2.0 is simpler than choosing which tie to wear. If my experience is any indication, he’s only going to get worse. He’s only going to get less in touch with objective reality and he’ll isolate himself more by tossing more and more members of his inner circle under the proverbial bus. While I’d be happy to see Bannon, Miller, and the Gorkas without the protections afforded by their jobs, the only way we get Trump out of the White House is legally. His frothing Nazi base has been given the green light and they will continue to show up in parks across America to preach hate until we stop them, one rally at a time. Our job is to keep our eyes on the ball, remembering that sometimes this game has more than one ball in the air at a time. We need to fight the Nazis while calling them what they are. We need to follow the Russia scandal and keep it in the news, this is what will get him. We need to support each other, none of us can be on all the time, this is exhausting. And, most importantly, we need to keep the pressure on. While Trump is the head of the snake, this is a long snake with deep roots in American history. We need to pull the whole thing out before we can begin to heal and fix this country. While I have been in parades and candlelight vigils and such, I have never been in what could be called a political protest until this weekend. But I am glad I did it. In fact, it has given me a great deal of satisfaction, and has cheered me up somewhat from what has been for some time a generally dark mood. The crowd ended up being MUCH bigger than was originally anticipated. I think they were expecting maybe 90,000 people, but the totals were probably more like 150,000 to 175,000. 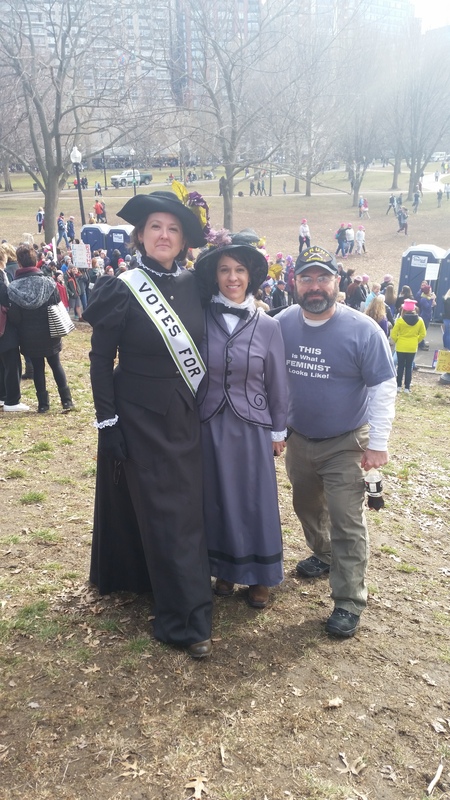 We saw these two women dressed as suffragettes, and I just had to get a picture with them. LOVED it. I would never have imagined that I would look back on the Presidency of George W. Bush with any type of nostalgia. And I certainly never imagined that I would live to see a Presidency that was not only worse than Bush’s, but is well on the way to topping the administration of James Buchanan as the absolute worst Presidency of all time.